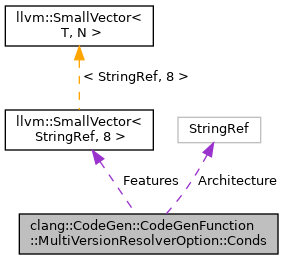 Definition at line 4302 of file CodeGenFunction.h. Definition at line 4306 of file CodeGenFunction.h. Definition at line 4303 of file CodeGenFunction.h. Referenced by clang::CodeGen::CodeGenFunction::EmitSanitizerStatReport(), and TargetMVPriority(). Definition at line 4304 of file CodeGenFunction.h.